Perhaps your aging parent or other relative has become ill or developed a condition that demands a lot of care. You love them and worry about their welfare and may consider it appropriate as their carer, for them to move into your home. Although this is an admirable gesture, it is not necessarily the best idea either for you or them. Aged parents often move into a child’s home (usually that of a daughter) after a stay in hospital or another significant event – perhaps a bad fall or illness – when it becomes apparent that they need more care and supervision. The decision is therefore made quickly and may not have been properly thought through. If you are in this situation, you need to seriously consider the following before going ahead. Has your parent had a care assessment to see if, with outside help, they can continue to live independently? Do you get on well enough with your parent while they live elsewhere for the relationship to work if you were living together? If you argue frequently now, consider how much more difficult the relationship will be if you were both under the same roof. Could you deal with the physical tasks that your parent requires, including intimate personal care? How will you deal with the emotional stress? What effect will it have on your employment? What effect will it have on the other members of your family? Is there any way that you could share the care with other siblings? It is a good idea to have a legal agreement drawn up between you and your parent even if this seems a little excessive. This should establish things like who owns the house, what each party is responsible for and what happens if one or other of you ends the arrangement. It is particularly important to get legal advice if for example your parent is selling their current home and/or putting money towards buying a house with your family. Although it might seem awkward or untrusting to seek independent advice, it is better for everyone in the long term that you are all sure of your position before committing yourselves. Involve your siblings with these discussions and ensure that they too are happy with the conclusions. Before making a decision, discuss the day-to-day issues. For example, how will the living arrangements work? Will your parent just have a bedroom, or will they have a self-contained bedsit or even a 'granny flat'? Is the house suitable or does it need adaptations? If the house needs to be adapted, there might be a grant available from the local council to help with the cost. Contact your local council for further details. People have different feelings about privacy and independence. How much privacy does your parent and your family want? Will your parent be able to keep up their own interests and entertain visitors? Will they share all meals with your family or would you prefer for them to be able to cook for themselves sometimes? If you have young or teenage children in the house, will your parent find it difficult if there is more noise or mess than they are used to? 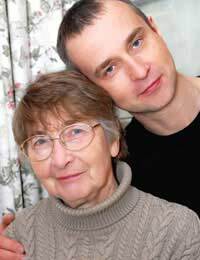 Finally, remember that the responsibilities of caring for your elderly parent will almost certainly increase over time – can you cope with them needing even more of your time and attention than they do now? All of these issues need to be thought through thoroughly before inviting your parent to live with you. After they have moved in, it can be very difficult to retrace your steps. The issues are quite different if you have a disabled child or spouse who falls ill. Their home is your home and it is quite probable that you will wish to care for them at home. Nevertheless, arrange for a care assessment and wherever possible, share the care with others. No matter how much you love them, you need to consider your own health and get breaks from time to time.